Fashion And Unregistered Designs – Is It All In The Jeans? There has been more than one significant High Court decision within the fashion industry recently. Firstly, the much published case concerning pop star Rihanna, who took legal action against retail giant Topshop and its parent company Arcadia Group Brands, for using her image on a T-shirt. Rihanna succeeded at the Court of Appeal in January 2015, who ruled that the fashion retailer’s unauthorised use of the singer’s photograph amounted to ‘passing-off’, ie illegally exploiting an unregistered trademark. Rather than exploiting celebrity status, the High Court case this month of G-Star Raw v Rhodi, concerned ‘exploitation’ of an unregistered design of jeans and provides some useful guidance in protection of intellectual property (IP) in design. G-Star is one of Europe’s leading denim fashion brands, who brought an action for infringement of design right in its Arc jean, against Rhodi, owner of the ‘Voi’ brand of jeans. G-Star’s brand of jean design has a prominent ‘keynote’ design over the knee area, where extra material is used as a design ‘motif’. 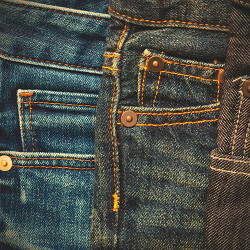 Rhodi argued that their jeans were created without reference to the Arc jean and that they were ‘just following general fashion trends in the denim market and to the extent that their styles have similarities to the Arc Pant this is due to them sharing generic features which had…become common’. The trial took place in October 2014, with the judge, Richard Spearman QC, reserving judgment until this month. Four members of the Rhodi group of companies were found to have infringed G-Star’s design rights, in nine separate Voi styles of jeans. Although copying is widespread in the fashion industry, no doubt the judgement will be taken on board by serious competitors in the jean market who are concerned at infringing the rights of others in this particular sphere. More than this though, fashion brands generally may similarly be expected to follow G-Star’s determined stance and similarly attempt to protect their unregistered IP rights – surely, it won’t all be in the jeans?